Not a MacBook fan? You can still make some mean beats with these alternatives. In 2002 the arrival of Mike Skinner’s ‘The Streets’ legitimised music that had been produced at home on a laptop, and the inexorable rise of the ‘bedroom producer’ began. Since then laptops have become more powerful, more portable and more capable of running the kind of high end software (Logic Pro, Ableton Live and Pro Tools to name a few) you would normally associate with a professional recording studio, and it’s the norm for a band (at any level) to utilize a laptop in their live setup. Apple, with its Mac Garageband and Logic first-party music making software, has often been the go-to machines for those looking to record their own tunes. But, if you're a struggling songwriter waiting for your big break, buying into Apple hardware can be a pricey investment. 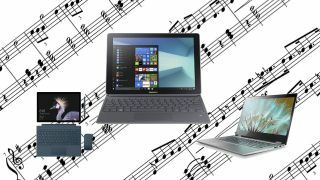 However, in the last few years the progress of technology has meant you can now get laptop performance in significantly smaller devices, namely tablets and 2-in-1 ultraportables, making producing music at home or on the road more convenient than ever, without needing to make the dive into Apple's MacBook line. With that in mind we have rounded up the best devices for music producers in search of their next production tool, when a Mac just isn't an option. Let’s get started. Now in its fourth generation, the Microsoft Surface Pro has been taking the fight to the MacBook since 2013, and the latest version is hugely compelling for music makers. Build quality is excellent, and the magnesium uni-body casing feels robust enough to endure life on the road but is also pleasingly light at only 770g. The 12.3-inch screen is bright, crisp and clear. The panel is particularly luminous, so great in low light/club conditions, and the high pixel resolution means using a DAW (Digital Audio Workstation) such as Cubase isn’t fiddly, especially when using the Surface Pen (sold separately £59.99/$94.95 AUD/$59.99 USD). Power comes from an Intel Core i5-6300U and 8GB of RAM and provides enough grunt to run most resource intensive music production software on the Windows Pro OS. Don’t expect it to power Pink Floyd’s next stage show though, with the battery life of around four hours disappointing. Nevertheless, the excellent Type Cover £149.99 ($249.95 AUD/$159.99 USD) is a joy to use and the USB 3.0 port makes hooking up MIDI equipment easy. The iPad Pro 12.9-inch may be one of Apple’s most misunderstood products (who wants/needs a giant iPad? ), but it makes a stella platform for music creation – arguably even more intuitive than the company's MacBook offerings. Importantly, the iPad Pro runs iOS 11, Apple’s mobile operating system, so you can’t run full DAWs as you might on the Surface Pro. What you can do is take advantage of the App Store’s unparalleled wealth of music making apps (including Korg synthesizers and even FL Studio), and Apple’s GarageBand (essentially Logic Pro light) remains the best entry level DAW around. It's a great introduction to digital music making. Build quality, weight (677 grams) and the phenomenal screen (2732 x 2048 pixels) are all impressive, but we’re not such a fan of the Smart Keyboard’s raised rubber keys. However, we were impressed by the four-speaker audio system, and the lack of a USB port is somewhat compensated for by the fact that many DAW manufacturers let you use the iPad as a controller (connecting via Bluetooth). The 2-in-1 market endured a stuttering start, but persistence pays off and the Yoga 720 proves you can have the best of both tablet and laptop worlds. The device offers a great deal to the music maker. The Intel Core i7 combines with 8GB of RAM to make it powerful enough to run complete DAWs, one USB and two USB-C ports make this ideal for connecting sound cards or MIDI equipment (you can always use a USB-C to USB 3.0 converter if you want more of the latter) and the battery life of nearly eight hours offers you the freedom to make music on the move without need for a power point. Build quality is very high and the sturdy hinge mechanism makes transitioning from laptop to tablet easy, the latter letting you use touch to manipulate instruments and effects to a greater degree than a mouse/keyboard combination ever could. Finally, the JBL speaker system offers a nice little extra in terms of audio performance. You wouldn’t associate a Chromebook with music production: they lack the necessary meaty specs to process and render software instruments over multiple tracks. However a growing number of apps in the Chromebook Web Store and an online DAW called Soundtrap make the Dell Chromebook 11 considering – especially on a budget. Originally designed for the classroom this is a rugged device that suits life on the road and the excellent battery life of nearly 10 hours provides some of the best portability in this group. The 180 degree hinge lets you achieve a comfortable viewing angle in any situation – perfect for making music in cramped conditions – and the stereo speakers are pleasingly loud. The Chrome operating system is simplicity itself and will be broadly familiar to anyone who’s ever used an Android phone, but it’s important to remember the Chromebook needs an internet connection to access most of its features (although offline functionality is constantly improving). Once online we suggest you head straight for Soundtrap. Here you can create sketches of songs over multiple tracks, and even share them with collaborators. Bringing up the rear is Samsung’s equivalent of the Surface Pro: the Galaxy Book. A large, 12-inch device that boasts an attachable keyboard (included in the price) and stylus, or S-Pen, that encourages you to make use of the device’s touch capabilities. Build quality is good, if a little plasticy, but the screen is superb and produces razor sharp images that are extremely rich in color. When you’re not making music, games and movies will look great. A good amount of power is provided by a Core i5 processor and 8GB of RAM so you’re music making applications should run without issue and, unlike the iPad Pro here, the Windows operating system means you aren’t locked into one ecosystem, offering you flexibility in choosing what those applications are. Pleasingly two USB ports provide plenty of space for attaching MIDI equipment such as a keyboard or microphone and the battery life of around four hours is about industry standard.